Aim of the study: To evaluate the electroclinical course and the correlation Electroencephalographic (EEG) pattern and epileptic seizures in an infant with Miller Dieker Syndrome (MDS) during the first year of life. Materials and Methods: MDS was diagnosed in the infant soon after birth and followed up from six months of life to one year, at the Department of Pediatrics, General Pediatric Operative Unit, Policlinico Vittorio Emanuele, University Hospital, XCatania, Italy, with clinical and serial EEG recording. Results: Aside from severe delay in the developmental milestone, the onset of the seizures was first noticed by the parents at the age of 4 months as brief slow tonic movements; at 6 months as tonic movements of the upper limbs with a slow rotations of the trunk, i.e. “subtle spams”; and at 7 months as typical “infantile spams” and tonic seizures. The EEG recording registered pattern of modified hypsarrhythmia (MH) correlated with “subtle spams” at the age of 6 months and at the age of 7 months the same EEG recording of MH associated to clinical expression of classical Infantile Spams (IS). Conclusions: In this infant, the EEG pattern and epileptic seizures were widely variable ranging clinically from brief anomalous movements to “subtle spams” and to typical infantile spams. At the same time, the EEG recording manifested first with MH and one month later with classical hypsarrhythmia. The EEG recording MH correlated first with clinical expression of subtle spams and the EEG remaining unchanged with the classical clinical expression of infantile spams. Lissencephaly (LIS) is a malformation of brain cortical development manifested by a smooth cerebral surface (agyria/pachygyria). The development of the human cerebral cortex follows several steps mainly involving cell proliferation, cell migration, and cortical organization. The disruption of any of these steps, including molecular genetic causes, results in abnormal formation of cerebral convolution or gyri. The histopathologic features show incomplete neuronal migration with a widened cortex only organized into layers, and large numbers of heterotopic neurons below the cortex. LIS, together with subcortical band heterotopia (SBH), represents two of the most severe forms of cerebral malformation.,, From the discovery of the first genetic causes of LIS involving the deletion 17p13.3 and of the most common causal genes LIS1 (PAFAH1B1) and DCK, more than 19 LIS–SBH associated genes have been reported.,,,,, Miller–Dieker syndrome (MDS) is a contiguous gene deletion of the short arm of chromosome 17 (17p13.3) presenting with severe intellectual disability, drug-resistant seizures, and facial dysmorphisms. Body organs may be also affected including the heart, genitalia, and kidneys. The facial dysmorphisms are quite distinctive and include microcephaly, a high and prominent forehead, bitemporal hollowing, short nose with upturned narix, edge lips downward, a thin vermilion border of the upper lip, and microretrognathia.,, The steps of development are only poorly reached and severe intellectual disability is the most frequent clinical sign. Most of the affected children die precociously as a result of intractable seizures and aspiration pneumonia. The seizures in MDS are widely variable and may present in several different types but more commonly as “infantile spasms” (ISs). Herewith we report on the clinical features and video-electroencephalographic (EEG) recording in a child with MDS in the course of the first year of life. A 6-month-old boy was referred to the Pediatric Clinic Policlinico-Vittorio Emanuele hospital, Catania (Italy), for presenting with drug-resistant seizures with the diagnosis of MDS. He is the second born of healthy, unrelated Italian parents. At the time of gestation, the mother was aged 34 and the father 38 years. The sister (aged 3 years) is healthy. The mother felt normal fetal movements during the gestation. A diagnosis of brain malformation was recorded during the 6 months of gestation as the result of intrauterine ultrasound (US), which disclosed ventriculomegaly, absence of corpus callosum, and intrauterine growth restriction. The mother denied having had any infection diseases or having used drugs or alcohol during her pregnancy. The boy was born at 37 weeks of gestation by spontaneous vaginal hasty delivery. The birth weight was 1800g, length 45cm, and head circumference 32cm. The apgar scores were 5 and 8 at 1 and 5 minutes, respectively. Soon after birth, he was admitted to the neonatal intensive care unit in another city hospital for treatment and clinical evaluation related to facial dimorphisms, cerebral malformation, low weight, and episodes of cyanosis and bradycardia. During this hospitalization, treatment for his respiratory distress and poor alimentation was started. During this period, lasted 26 days, he was submitted to several laboratory investigations, genetic analysis, and neurological investigations. Routine laboratory findings disclosed the presence of mild metabolic acidosis, which was immediately corrected. Brain magnetic resonance imaging (MRI) showed severe LIS consisting of wide-spread agyria and restricted areas of pachygyria [Figure 1]A]. The EEG showed poorly organized background and the presence of spikes, mainly in the temporo–central–occipital regions [[Figure 1]B]. At US, colpocephaly and absence of normal cortical gyration with simplified sulci and cerebral scissors were noticed. The parents did not refer anomalous movements from birth to the first 4 months of life when some daily episodes of slow tonic movements of the upper limbs were noticed. General hypotonia and others signs of development delay were still present, and difficulty in maintaining the head upright and persisting episodes of slow movements in the upper limbs were reported by the general pediatrician. During this period, the baby showed a good growth improvement. At the age of 6 months, he was admitted for the first time for our observation, due to slow tonic seizures sometimes associated to short phase of desaturation prevalently during the sleep. His weight was 6kg (third percentile); length 62cm (>third percentile), and head circumference 40cm (<third percentile). Mild facial dysmorphism was noticed and consisted of high forehead, slight bitemporal hollowing, epicanthus, small upturned nose, low-set and abnormally shaped ears, slim lips with edge under-down, and retrognathia. The neurological examination showed severe hypotonia with difficulty in maintaining the sitting position and poor reactivity. The anterior fontanel was open 0.5×0.5. Partial bilateral ptosis was noticed. The seizures were mainly localized at the face with blinking and slow tonic movements of the upper limbs with a slow rotation of the trunk afterward the left side appearing prevalently before sleeping. The intercritical video-EEG showed a pattern of modified hypsarrhythmia (MH) consisting of random high-voltage spikes and slow waves predominant in the occipital areas and a lack of synchronism with a chaotic appearance [[Figure 2]A]. The critical video-EEG showed a typical electrical suppression during an epileptic spasm: the background was variable and mainly consisted of the combination of hypervoltage slow waves with a bout of rapid low amplitude activity or a diffuse attenuation of the trace. 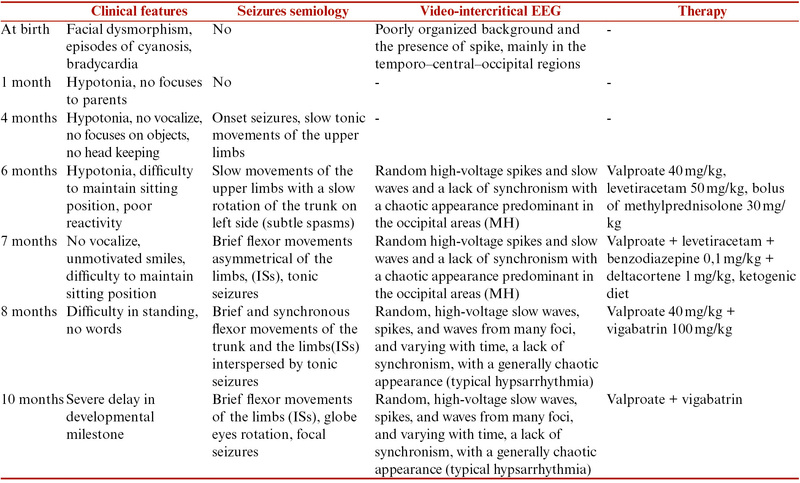 At 4 weeks later, whereas the intercritical EEG remained unchanged [[Figure 3]A], the types of seizures showed different features, presenting with brief and synchronous movements of the head, trunk, and limbs, typical of ISs [[Figure 3]B]. These anomalous movements usually lasted about a few seconds and frequently occurred in clusters. The critical video-EEG showed a typical electrical suppression during the epileptic spasms. As the seizures persisted with high frequency, treatment with valproic acid (40mg/kg/day), levetiracetam (50mg/kg/day), and vitamin B6 (5mg/kg/day) was started. Also, the administration of a ketogenic diet failed to give good response. With the gradual addition of midazolam to the treatment regimen, a reduction of the frequency of seizures was achieved, but the seizures still persisted. Routine laboratory analyzes, including blood count, coagulation testing, blood lactate, pyruvate, glucose and ketones, creatine kinase, copper, vitamin D, ceruloplasmin, plasma and urine amino acids, organic urinary acids, purine and pyrimidine, 7-dehydrocholesterol, and total cholesterol were normal. Renal and abdominal US investigations were also normal. The child was discharged from the hospital and followed up in day hospital. 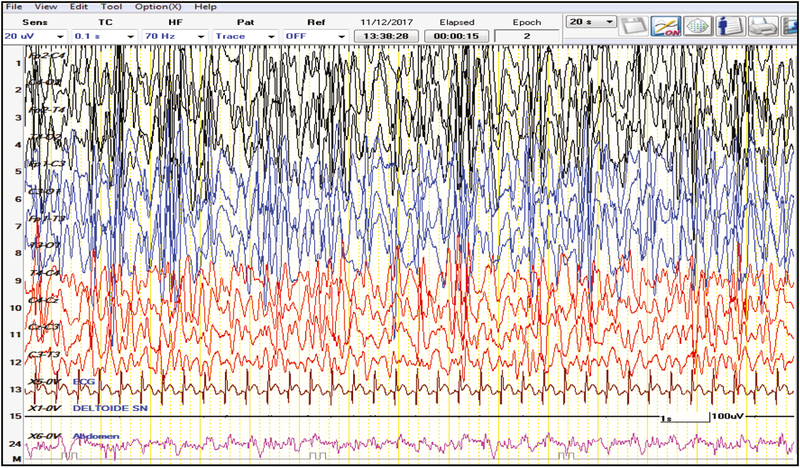 At the age of 8 months, the typical IS seizures were still present and correlated with an EEG intercritical pattern of hypsarrhythmia [[Figure 4]. From the age of 8 to 12 months, both clinical phenotypes and EEG recording unchanged, aside from the onset of focal seizures (see [Table 1]). Chromosomal microarray analysis C4×180K (AMADID 022060-Agilent CytoGenomics edition 3.0 [Agilent, Santa Clara, CA]) showed a microduplication of the distal extremities of the long arm of chromosome 1 in the region 1q44 about 4.2Mb and microdeletion of the distal region of the short arm of chromosome 17 in the region p13.3p13.2 about 3.8Mb including the critical region for the MDS. The fluorescence in situ hybridization test confirmed the molecular anomaly and allowed us to associate the micro-rearrangement to the chromosome 17 deriving from a de novo unbalance translocation between the long arm of chromosome 1 and the short arm of chromosome 17 with breakpoint in 1q44 and 17p13.2, respectively. In MDS, different phenotypes of seizures, including partial complex and epileptic syndromes such as West syndrome, are recorded.,, The patients have intractable epileptic seizures and the onset of the crises is precocious and manifested in a range from a few days to 2 years.,,, In a study by de Wit et al., five patients had their onset of seizures in the neonatal period, seventeen had ISs, and two suffered from multifocal epilepsy. The prognosis of MDS is severe. According to the survey of de Wit et al. in a long-term (mean length follow-up of 14 years) performed in 24 patients affected by LIS type 1, only 11 were alive at the evaluation. All the patients showed severe intellectual disability, intractable epilepsy, and need of special care and dependency. In the proband, at the age of 6 months, the video-EEG showed persistent occipital focus discharges suggestive of MH with a corresponding clinical feature of “subtle spasms.” One month later, the clinical features of seizures took the aspect of typical ISs, whereas the EEG pattern of MH remained unchanged. In the following months, the ISs were still present and focal seizures were recorded in correlation with an EEG pattern of hypsarrhythmia. Some indications are raised by the report on this child regarding the clinical and EEG pattern during the course of the first year of life: subtle spasms in patients with MDS have not been commonly reported. Moreover, to note, the correlation of MH and focal discharges associated first with phenotype seizures of subtle spasms and subsequently of IS. We hypothesize that the clinical and EEG anomalies reported in this patient are to be related to the areas of cerebral malformation prevalently acting and to the time of the brain development. The authors wish to thank American Manuscript Editors (USA) for editing the manuscript. We confirm that we have read the Journal’s position on issues involved in ethical publication and affirm that this report is consistent with those guidelines. Kato M, Dobyns WB. Lissencephaly and the molecular basis of neuronal migration. Hum Mol Genet 2003;13:R89-96. Olson EC, Walsh CA. Smooth, rough and upside-down neocortical development. Curr Opin Genet Dev 2002;13:320-7. Guerrini R, Dobyns WB, Barkovich AJ. Abnormal development of the human cerebral cortex: genetics, functional consequences and treatment options. Trends Neurosci 2008;13:154-62. Pavone L, Rizzo R, Dobyns WB. Clinical manifestations and evaluation of isolated lissencephaly. Childs Nerv Syst 1993;13:387-90. Pavone L, Corsello G, Pavone P, Iannetti P. Lissencephalic syndromes: brain and beyond. Front Biosci (Schol Ed) 2010;13:85-95. Dobyns WB, Stratton RF, Parke JT, Greenberg F, Nussbaum RL, Ledbetter DH. Miller-Dieker syndrome: lissencephaly and monosomy 17p. J Pediatr 1983;13:552-8. Di Donato N, Chiari S, Mirzaa GM, Aldinger K, Parrini E, Olds C, et al. Lissencephaly: expanded imaging and clinical classification. Am J Med Genet A 2017;13:1473-88. Dobyns WB, Curry CJ, Hoyme HE, Turlington L, Ledbetter DH. Clinical and molecular diagnosis of Miller-Dieker syndrome. Am J Hum Genet 1991;13:584-94. Reiner O, Carrozzo R, Shen Y, Wehnert M, Faustinella F, Dobyns WB, et al. Isolation of a Miller-Dieker lissencephaly gene containing G protein beta-subunit-like repeats. Nature 1993;13:717-21.
des Portes V, Francis F, Pinard JM, Desguerre I, Moutard ML, Snoeck I, et al. Doublecortin is the major gene causing X-linked subcortical laminar heterotopia (SCLH). Hum Mol Genet 1998;13:1063-70.
de Wit MC, de Rijk-van Andel J, Halley DJ, Poddighe PJ, Arts WF, de Coo IF, et al. Long-term follow-up of type 1 lissencephaly: survival is related to neuroimaging abnormalities. Dev Med Child Neurol 2011;13:417-21. Lux AL, Osborne JP. A proposal for case definitions and outcome measures in studies of infantile spasms and West syndrome: consensus statement of the West Delphi group. Epilepsia 2004;13:1416-28. Hrachovy RA, Frost JD Jr, Kellaway P. Hypsarrhythmia: variations on the theme. Epilepsia 1984;13: 317-25.